Three years after his horse American Pharoah won the first Triple Crown in almost four decades, Southern California trainer Bob Baffert did it again as another of his star thoroughbreds — Kentucky Derby and Preakness winner Justify — held off the pack to take victory in the famed Belmont Stakes in New York and place himself firmly into racing’s pantheon. Justify — an imposing chestnut colt based at Arcadia’s Santa Anita Park — led the grueling 1-point-5-mile Belmont from the start Saturday, crossing the finish line just under two lengths ahead of runner-up Gronkowski. Justify — now undefeated in six starts in less than four months — was unraced as a 2-year-old and ran in his first career start in February at Santa Anita, winning by 9 1/2 lengths. He subsequently went on to victory in two other races at Santa Anita, including the Santa Anita Derby, while on his way to the Triple Crown. Justify was the heavy 4-5 favorite heading into the race. Justify won the Belmont starting from the rail. The last Triple Crown winner from that spot at the Belmont was the legendary Secretariat, 45 years ago to the day Saturday. Justify is just the second horse to capture the Triple Crown undefeated, joining Seattle Slew who accomplished the same feat in 1977. Justify, the first horse to sweep the series without racing at age 2, beat nine others to win Saturday — more competition than any other Triple Crown winner has defeated in the Belmont. 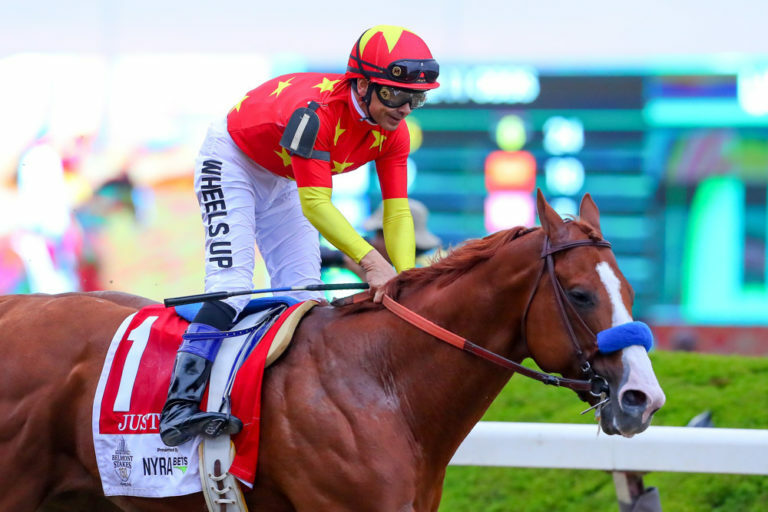 Justify defeated 35 horses across the Kentucky Derby, Preakness and Belmont. Baffert joins “Sunny Jim” Fitzsimmons as the only trainers to win the Triple Crown twice. Fitzsimmons won in 1930 with Gallant Fox and in 1935 with Omaha. It was Baffert’s fifth attempt to win the Triple Crown — three more than any other trainer. Jockey Mike Smith rode Justify in all but his first start. The 52-year-old Smith, a racing legend in his own right, gave the credit to his mount.